This set of Engineering Geology online quiz focuses on “Formation and Descriptive Study of Minerals – 04”. Explanation: The carbonate minerals are generally and most widely found in the sedimentary and metamorphic rocks. 2. Name the carbonate mineral which is found in ultrabasic igneous rocks. Explanation: Magnesite is found in the ultrabasic igneous rocks which is not common among the other minerals and also among the other groups. 3. What is the structure or form of dolomite? Explanation: Dolomite mineral is usually found in rhombohedral structure. In most cases it is not found in any other form or structure. 4. What is the colour of the magnesite when pure? Explanation: Magnesite mineral is found is colours like white, shades of grey and also sometimes brown. But when it is in the pure form, it is found in bone white colour. 5. What is the colour and diaphaneity of a calcite mineral respectively? Explanation: The calcite mineral is white in colour and its diaphaneity is transparent. The chemical composition of calcite is calcium carbonate. 6. State true or false. The carbonate minerals have high hardness. Explanation: The hardness of the carbonate minerals usually varies between 2.5 and 3. Hence they are said to have low hardness. 7. What is the streak given by calcite minerals? Explanation: Unlike the quartz minerals, the carbonate minerals give white streak which is an important distinguishing property of the minerals from other groups. 8. Dolomite is formed by the action of magnesian rich sea water on which deposit? Explanation: As a rock constituent, dolomite is believed to have been formed by action of magnesian rich sea water on original limestone deposit. This process is called in petrology dolomitization. 9. Which carbonate mineral has this chemical composition- CaCO3 Mg(CO3)2? Explanation: Dolomite has the chemical composition CaCO3 Mg(CO3)2. Whereas calcite doesn’t have Mg in its composition and magnesite lacks Ca in its composition. 10. Which lustre cannot occur to the calcite? Explanation: Calcite minerals show few lustres, vitreous, waxy, silky but they do not show adamantine lustre which is exclusively shown by diamond. 11. How many sets of cleavage is shown by calcite minerals usually? Explanation: The calcite minerals are known to show three sets of cleavage which is pretty distinctive compared to other mineral groups. 12. Which mineral is used as refractory material? Explanation: The major uses of magnesite mineral is that it used as refractory materials in the refracrtory bricks installed in the lining of the furnaces and also used for chemical compounds of magnesium. 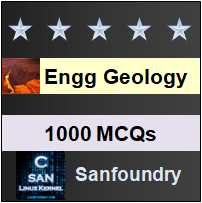 To practice all areas of Engineering Geology for online Quizzes, here is complete set of 1000+ Multiple Choice Questions and Answers.